Our research on perceived societal marginalization has been highlighted by a press release of the WWU Excellence Cluster Religion and Politics and captured in the Westfälische Nachrichten and Münstersche Zeitung. New paper by Marianne Hannuschke, Mario Gollwitzer, Katharina Geukes, Steffen Nestler, & Mitja Back is now in press in the Journal of Personality - Neuroticism and interpersonal perception: Evidence for positive, but not negative, biases. With a keynote, 4 talks and a chaired symposia our work group contributed to the 3rd World conference on personality in Hanoi, Vietnam. Sarah Humberg successfully defended her excellent dissertation - Congratulations, Dr Sarah Humberg! Leonie Hater is supported by a grant (3,400 €) of the University of Münster for a research project on meta-accuracy in the context of a research stay at the University of British Columbia (Vancouver). Congratulations! Our research on the personality of the rich has been featured in recent issues of several newspapers such as the Welt, DerStandard, Wirtschaftswoche, and Kieler Nachrichten. Our research on narcissism and first impressions is covered in a recent issue of Psychology Today. Our study on the personality of high net-worth individuals was featured in a press release of the WWU and covered in the Westfälischen Nachrichten. With 9 first-authored and 6 co-authored talks, 1 chaired symposium and 1 poster our working unit made a strong contribution to the 51st Congress of the German Society for Psychology (DGPs) in Frankfurt. Our research on friendship is covered in a recent issue of Spektrum. With 10 talks, a poster, and a chaired session our work group made a strong contribution to 19th European Conference on Personality in Zadar, Croatia. Marius Leckelt has received an offer of an assistant professorship (Juniorprofessur) for Personality Psychology and Psychological Assessment at the University of Mainz. Congratulations! Our research on judgment processes during selection procedures is highlighted in a recent press release of the University of Münster. Our research on friendship is covered in a recent press release of the University of Münster. Our research on first impressions towards and from refugees is highlighted in a recent press release of the University of Münster. Our research on self-knowledge is covered in a recent article of ZEIT ONLINE. Our research on the assessment of antagonistic personality traits is covered in a recent article of Welt. Our research on implicit aspects of personality is covered in a recent article in Scientific American. Our research on friendship is covered in a recent issue of the Westfälische Nachrichten. Our work on first impression of and towards refugees is featured in the latest issue of wissen.leben. Mitja Back conributed to the Magazine of the Cluster of Excellence Religion and Politics with an interview on his investigations about first impressions from and towards refugees. Lukas Mundelsee received the asp-Studienpreis 2018 from the Arbeitsgemeinschaft für Sportpsychologie in der Bundesrepubik Deutschland e.V. for his master thesis on "Perfectionists under pressure: Investigating their performances in three motor tasks". Mitja Back and Marius Leckelt were announced to held the best lecture/ best seminar of the past semester - congratulations! With a keynote, 13 talks, and 2 chaired symposia our work group made a strong contribution to the 14th meeting of the section Differential Psychology and Psychological Assessment of the German Psychological Society in München. 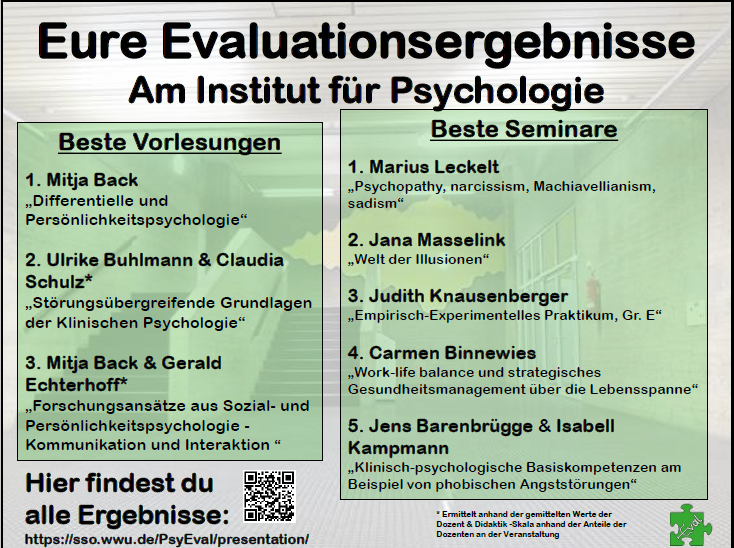 We also contributed with another 4 talks to meetings of the sections Developmental and Pedagogical Psychology, Forensic Psychology, and Methods and Evaluation in Münster, Jena, and Tübingen, respectively. Marius Leckelt contributed a quiz on narcissism to the ZEIT Online "Beat the Prof" section. 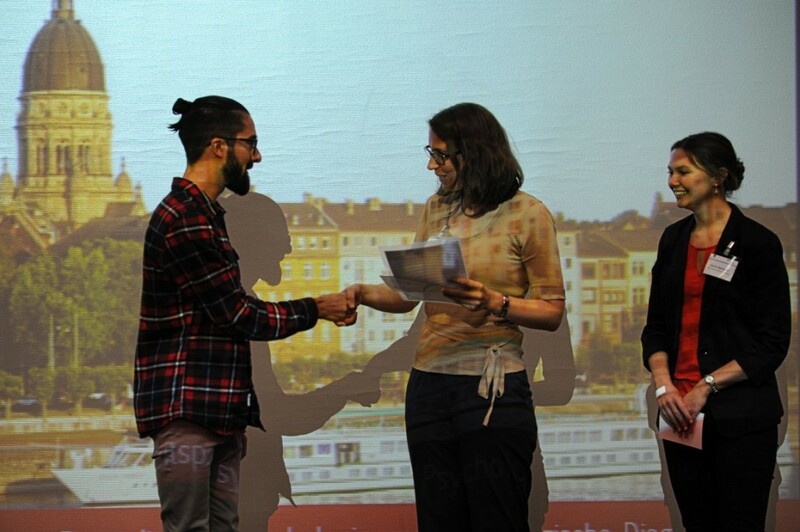 Simon Breil received the prize for the best masters thesis of the section Differential Psychology and Psychological Assessment of the German Psychological Society for his work on How personality and context shape the behaivor in real-life social interactions. Congratulations! 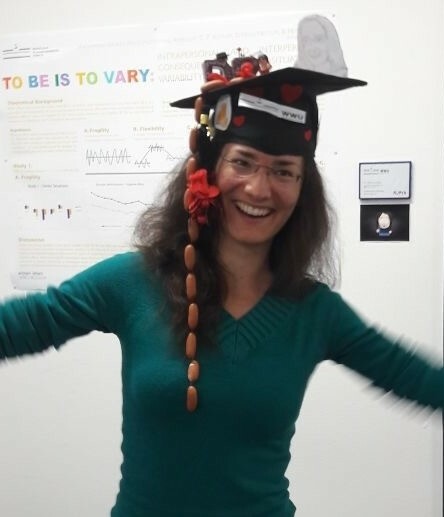 Stefanie Wurst successfully defended her excellent dissertation on Processes of dating and mate selection in initial romantic encounters and beyond - Congratulations, Dr Stefanie N Wurst! 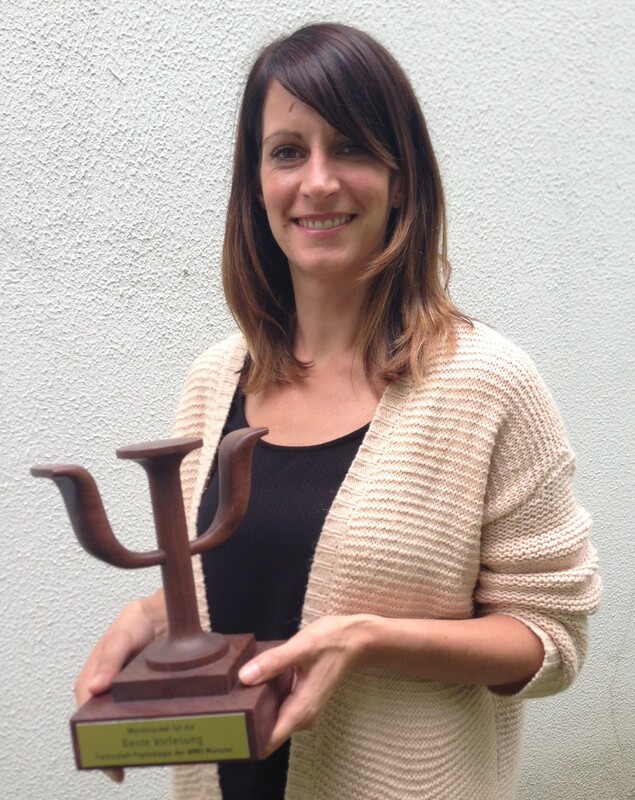 Katharina Geukes received the PsyEval's award for giving the best lecture of the past semester (i.e., Grundlagen psychologischer Diagnostik). Congratulations! A new issue of the European Journal of Personality has just been published. EJP is now also on Facebook and Twitter. The new Journal impact factors are out. With a 2-year IF of 3.7 the European Journal of Personality consolidates its strong position as the second highest empirical personality journal. With a chaired symposia, and 4 talks our work group contributed to the 5th Biennial Meeting of the Association of Research in Personality in Sacramento, USA. Open Science Initiative and Open Science Concept in Psychology in Münster! The Institutes for Psychology of the University of Münster have established an Open Science Initiative and agreed on a joint concept for fostering Open Science. The Open Science Initiative of is actively following current efforts to improve the quality of psychological research, discusses implication for the study of psychology at the University of Münster and is working together with all research units of the department to establish the central premises of Open Science in reseach and instruction. The latest version of the Open Science concept-paper of the Institutes for Psychology is available for download here. Maarten van Zalk has received an offer of a professorship in developmental psychology (W3) at Osnabrück University and an offer of a professorship for Social Psychology (W2) at Technische Universität Dresden. Congratulations! He has declined the offer from Dresden and accepted the offer from Osnabrück and will start there the 1st of October 2017. Prof. Dr. Mitja Back is supported by a grant of the Cluster of Excellence "Religion and Politics" of the University of Münster for the research project "Prejudice, conspiracy theories, and negative stereotypes: The influence of individual and contextual religious factors". Our research on narcissism and self-esteem is featured on theconversation.com. Our research on narcissism and romantic relationships is featured on psychologytoday.com. Our research on narcissism is featured in an upcoming issue of Gehirn und Geist: "Ego am Limit". Marius Leckelt was recently interviewed by SWR Aktuell and WDR 1Live on Donald Trump's narcissism. Our research on narcissism is featured in a recent article of Focus. Prof. Dr. Mitja Back joined the Cluster of Excellence “Religion and Politics" of the University of Münster and is supported by a grant for the research project "Integration at first sight: The role of religion for first mutual impressions of refugees and Germans“. 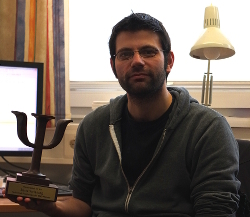 Simon Breil and Simon Mota received the PsyEval's award for giving the best seminar / best newcomer seminar of the past semester - congratulations! In an article in ZEIT ONLINE Mitja Back commented on the narcissism of Donald Trump. The 2017 Editorial of the European Journal of Personality by Mitja Back is now published. With 2 chaired symposia, 2 talks and 3 poster presentations our work group contributed to the 18th Annual Meeting of The Society for Personality and Social Psychology in San Antonio, USA. New paper by Violetta Khoreva, Vlad Vaiman, and Maarten H.W. Van Zalk is now published in the Employee Relations: "Talent management practice effectiveness: investigating employee perspective." New paper by Violetta Khoreva and Maarten H.W. Van Zalk is now published in the Career Development International: "Antecedents of work engagement among high potential employees." Marius Leckelt has been interviewed for an article in the "Hallo Münster" on Donald Trump, American culture, and narcissism. Marius Leckelt has been interviewed for an article in the "Die Welt" on Donald Trump and narcissism. Prof. Dr. Mitja Back is supported by a grant of the German Academic Exchange Service for the renewal of a guest professorship "Applied Statistics and Network Analysis“ (Dr. Maarten van Zalk; 04/2017-03/2018). With 2 chaired symposia and 10 talks our working unit made a strong contribution to the 50th Congress of the German Society for Psychology (DGPs) in Leipzig. Our research on narcissism and its links to socio-economic conditions during emerging adulthood has been featured in an article by the Association for Psychological Science. With 3 chaired symposia, 11 talks, and 2 poster presentations our work group made a strong contribution to the 18th European Conference on Personality in Timisoara (Romania). Mitja Back is appointed Editor of the European Journal of Personality. Sarah Humberg and Stefanie Wurst received scholarships from the German Academic Exchange Service (DAAD) to attend the European Conference on Personality 18 in Timisoara, Romania. 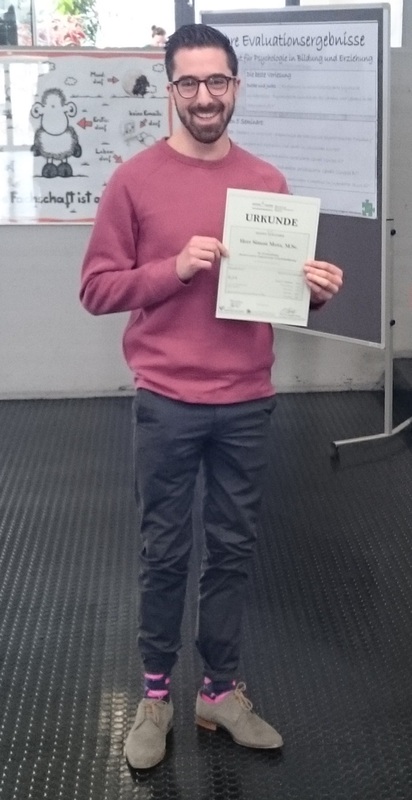 Marius Leckelt received a scholarship from the German Academic Exchange Service (DAAD) for research stay with Dr Jason Rentfrow at the University of Cambridge. Marius Leckelt received a scholarship from the European Association for Personality Psychology to attend the European Conference on Personality 18 in Timisoara, Romania. With a 3 talks and a chaired symposia our work contributed to the 2nd World conference on personality in Buzios, Brasil. New entry on "Interpersonal Attraction" by Stefanie Wurst and Mitja Back in the Encyclopedia of Lifespan Human Development is now in press. 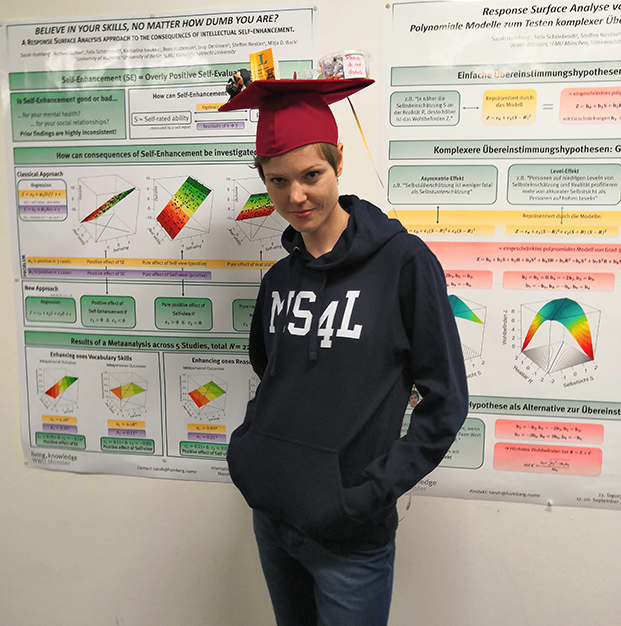 Steffen Nestler received the PsyEval's award for giving the best lecture of the past semester as well as a special award for receiving this prize three times in a row - congratulations! Steffen Nestler has received and accepted an offer of a professorship for Psychological Methods from the University of Leipzig. Congratulations! Meeting "Judgment Accuracy: Basics and Applications"
Judging others is a widespread phenomenon in plenty of different contexts in daily life. Doctors and therapists consider symptoms of patients and judge on critical diseases and disorders, managers judge the aptitude of applicants for a job, teachers judge student’s achievements deciding about graduation and each and every one of us judges others in everyday life regarding their behavior, appearance or traits. In this small scientific meeting international experts will present basics and latest insights on the science of judgment accuracy and discuss a wide range of practical implications. Marius Leckelt has been interviewed for an article in the Welt am Sonntag on "The Dark Triad: Why ruthless people get ahead"
Maarten van Zalks work together with Miles Hewstone on social networks and intergroup contact is covered in a recent feature on BBC Radio 4 and a recent article in "The Guardian"
Prof. Dr. Mitja Back is supported by a grant of the German Academic Exchange Service for the implementation of a guest professorship "Applied Statistics and Network Analysis“ bewilligt (Dr. Maarten van Zalk; 04/2016-03/2017). New paper by Marius Leckelt, Mitja D. Back, Joshua D. Foster, Roos Hutteman, Garrett Jaeger, Jessica McCain, Jean M. Twenge, and W. Keith Campbell is in press in the Journal of Research in Personality: "Entering adulthood in a recession tempers later narcissism – But only in men". Maarten van Zalk was awarded the Newton International Fellowship by the British Academy. The Newton International Fellowship was established in 2008 to select the very best early career researchers across the following disciplines: Physical Sciences, Natural Sciences, Social Sciences, and Humanities. The fellowship covers a total of £48.000. New Chapter by Mitja Back and Steffen Nestler on "Dual Process Approaches to Personality" is now in press in Deutsch, R., Gawronski, B., & Hofmann, W. (Eds.) (in preparation). Reflective and impulsive determinants of human behavior. New York: Psychology Press. With a keynote, 12 talks, and 3 chaired symposia our work group made a strong contribution to the 13th meeting of the section Differential Psychology and Psychological Assessment of the German Psychological Society inMainz. Mitja Back was invited to remain on the Editorial Board of Social Psychological and Personality Science. A new chapter featuring our research on personality development in the context of international mobility is now in press: Zimmermann, J., Hutteman, R., Nestler, S., Neyer, F. J., & Back, M. D.(2015). Und wenn Sie zurückkommen, sind Sie plötzlich erwachsen? Auslandserfahrungen als Kontext der Persönlichkeitsentwicklung. In Fachstelle für Internationale Jugendarbeit der Bundesrepublik Deutschland e.V. (Ed. ), Forum Jugendarbeit International (pp. 203-213). Bonn: IJAB-Verlag. New Chapter by Mitja Back and Steffen Nestler on "Accuracy of Judging personality" is now in press J. A. Hall, M., Schmid Mast, & T. V., West (Eds.). The social psychology of perceiving others accurately. Cambridge University Press. Two new chapters featuring our research on biases in wikipedia are now in press: (1) Oeberst, A., Cress, U., Back, M. D., & Nestler, S. (in press). Individual versus collaborative information processing: The case of biases in Wikipedia. In U. Cress, H. Jeong, & J. Moskaliuk (Eds. ), Mass collaboration and Education. Cham, Switzerland: Springer International Publishing. and (2) von der Beck, I., Oeberst, A., Cress, U., Back, M. D., & Nestler, S. (im Druck). Hätte die Geschichte auch anders verlaufen können? Der Rückschaufehler zu Ereignissen in Wikipedia. In T. Wozniak, U. Rohwedder & J., Nemitz (Hrsg. ), Wikipedia und Geschichtswissenschaft. Oldenbourg: DeGruyter. Steffen Nestler received the PsyEval's award for giving the best lecture of the past semester - congratulations! Mitja Back is appointed Editor of the new open access journal Collabra. With 2 chaired symposia, 2 talks and a poster presentation our work group contributed to the 4th Biennial Meeting of the Association of Research in Personality in St. Louis, USA. Joscha Stecker is supported by a grant (5000 €) of the University of Münster for the research project "Developing a cooperation between the University of British Columbia (Vancouver) and the University of Münster and organize an interdisciplinary conference on accurate judgments". Katharina Geukes received a scholarship for the University of Münster's 'Erstklassig!' mentoring programme for outstanding postdoctoral reseachers - congratulations! Mitja Back has been elected as a member of the 2016 Program Committee of the annual meeting of the Society for Personality and Social Psychology and as a Program Committee Co-Chair of the 2017 annual meeting of the Society for Personality and Social Psychology. Our work on Narcissism and I-Talk is featured in a recent article in DER SPIEGEL pdf. Our research on narcissism is featured in a recent article in Scientific American. Our team is organizing this semesters colloquium of the Department of Psychology. Check out the schedule here. With 2 talks and 3 poster presentations our work group contributed to the 16th Annual Meeting of The Society for Personality and Social Psychology in Long Beach, USA, and the 1st International Convention of Psychological Science in Amsterdam, NL. Our research on narcissism in actors is featured in a recent article in Wirtschaftspsychologie aktuell. New research assistant position is available - see announcement. Dr. Steffen Nestler and Prof. Dr. Mitja Back are supported by a grant of the German Research Foundation (DFG) for the project „Understanding and enhancing the accuracy of self- and meta-judgments of personality: An integrative lens model approach”. Our research on online communication and friendship is featured in the latest issues of the ECHO newspapers (online version, print version pdf). Our research on narcissism is covered in the latest issue of Personalquarterly. With a chaired symposium and 12 talks our work group made a strong contribution to the 49th Congress of the German Psychological Society in Bochum from September 21 to September 25 2014. Mitja Back has declined offers of a professorship for Personality Psychology at the Humboldt University Berlin and of a professorship for Psychological Assessment, Differential and Personality Psychology at the Christian-Albrechts-University Kiel and accepted the offer from the University of Münster. Our research on international exchange experiences and the development of self-esteem is featured in a recent article in the Westfälische Nachrichten, the Neue Osnabrücker Zeitung and Bild der Wissenschaft. Our research on international exchange experiences and the development of self-esteem is featured in a recent article in the Süddeutsche Zeitung. New WWU press release features our research project on international exchange experiences and the development of self-esteem. Our latest publications on this issue can be found here (Wherever I may roam: Processes of self-esteem development from adolescence to emerging adulthood in the context of international student exchange). With 2 chaired symposia, 7 talks and a poster presentation our work group makes a strong contribution to the 17th European Conference on Personality in Lausanne (Switzerland) from July 15 to July 19 2014. Katharina Geukes received the PsyEval's Newcomer Award for being voted best new lecturer of the past semester - congratulations! Mitja Back has received an offer of a professorship for Personality Psychology at the Humboldt University Berlin and offer of a professorship for Psychological Assessment, Differential and Personality Psychology at the Christian-Albrechts-University Kiel. With a talk on "Perfectionism, performance, and performance-variability under pressure" Katharina Geukes contributes to the 'Performing under Pressure - International and Interdisciplinary Symposium: 46th Annual ASP-Meeting (Arbeitsgemeinschaft für Sportpsychologie) and Art in Motion 2014' in Munich. Our research on narcissism is covered in a radio feature for WDR5 - Leonardo (starting at 31:50). Our research on friendship is featured in the latest issues of the tageszeitung (taz) and the Apothekenumschau. 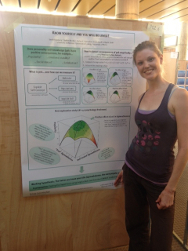 This semester's "HiWi"-award was presented to Katharina Geukes - congratulations! Our research project on the Reception and production of scientific information in Wikipedia is featured by terra digitalis an online platform of the German Research Foundation (DFG) in the context of the Science Year 2014 "The Digital Society". With 3 talks, 3 poster presentations and a chaired symposium our work group made a strong contribution to the 15th Annual Meeting of The Society for Personality and Social Psychology in Austin, USA. Paper by Juliane Stopfer, Boris Egloff, Steffen Nestler, and Mitja Back is now published in the European Journal of Personality: Personality Expression and Impression Formation in Online Social Networks: An Integrative Approach to Understanding the Processes of Accuracy, Impression Management, and Meta-Accuracy. pdf (Supplemental Online Material can be found here). Our research on friendship is featured in the latest issue of 20minuten. Katharina Geukes started as a research assistant in our lab – welcome! Our research on zero acquaintance judgments and the lens model is featured in the latest issue of the Observer (Association for Psychological science) link. Paper by Mitja Back, Albrecht Küfner, Michael Dufner, Tanja Gerlach, John Rauthmann, and Jaap Denissen is now published in the Journal of Personality and Social Psychology: Narcissistic admiration and rivalry: Disentangling the bright and dark sides of narcissism. pdf (brief documentations of different versions of the NARQ can be found here. Marius Leckelt started as a research assistant in our lab – welcome! Our research on personality expressions and interpersonal perceptions in Online Social networks is featured in the latest issue of the InternetMagazin. Albrecht Küfner spoke about our research on narcissism in a TV-documentary on einsfestival. With a keynote, 4 talks, and 2 chaired symposium our work group made a strong contribution to the 12th meeting of the section Differential Psychology and Psychological Assessment of the German Psychological Society in Greifswald. Our research on narcissism is featured in the latest issue of the Westfälische Nachrichten. Our research on narcissism is discussed in the latest issue of SPIEGEL WISSEN and also covered in SPIEGEL ONLINE. new WWU press release features our ongoing research projects on narcissism. Our latest publications on this issue can be found here (Narcissistic admiration and rivalry: Disentangling the bright and dark sides of narcissism) and here (The two pathways to being an (un-)popular narcissist). Our 2010 paper on first impressions of narcissists can be found here. new WWU press release (English version, German version) features our ongoing research projects about personality expression and impression formation in Online Social Networks (OSNs) such as Facebook. Our latest publications on this issue can be found here (personality and popularity in OSNs) and here (accuracy, impression management, and meta-accuracy in OSNs). Our 2010 paper on accurate personality impressions in Facebook can be found here. Juliane Stopfer started her new job as a PostDoc in the Lab of Lars Penke at the University of Göttingen. Our research on narcissism is featured in the latest issue of the Westdeutsche Allgemeine Zeitung (WAZ). Our research on friendship and facebook is featured in the Kölner Stadtanzeiger. Dr. Steffen Nestler and Prof. Dr. Mitja Back are supported by a grant of the German Research Foundation (DFG) for the project “Reception and production of scientific information in Wikipedia: The influence of hindsight bias and social categorization” within the Special Priority Program Science and the Public. With 2 talks, 2 poster presentations and 2 chaired symposia our work group made a strong contribution to the 3rd Biennial Meeting of the Association of Research in Personality in Charlotte, USA. New paper by Juliane Stopfer, Boris Egloff, Steffen Nestler, and Mitja Back now in press in the European Journal of Personality: Personality Expression and Impression Formation in Online Social Networks: An Integrative Approach to Understanding the Processes of Accuracy, Impression Management, and Meta-Accuracy.pdf (Supplemental Online Material can be found here). Our PERSOC framework for understanding the dynamic interplay of personality and social relationships was featured as Editor's Choice in the June Issue of the APS Global Observer. Our research on friendship is featured in latest issues of Brigitte and Women's health. Our research on friendship is featured in the latest issue of EMOTION. Mitja Back was invited to join the Program Committee for the 2014 SPSP (Society for Personality and Social Psychology) conference in Austin, TX. Our research on friendship is featured in the latest issue of ZEIT Wissen (p. 74). Stefanie Wurst started as a research assistant in our lab – welcome! Meinald Thielsch has been chosen as alternate member (1st successor) for the board of the Deutsche Gesellschaft für Online-Forschung (DGOF). With a presentation and 2 posters our workgroup contributed to the General Online Research 2013 in Mannheim. With three presentations our workgroup contributed to the 1st World Conference on Personality (Stellenbosch, South Africa). Mitja Back was invited to join the Editorial Board of the Journal of Research in Personality. Our seminars on psychological examination were the best evaluated courses of the last semester. Our research on friendship is featured on jetzt.de (Süddeutsche Zeitung). Albrecht Küfner gave an invited talk ("Personality, interpersonal perceptions and social relationships") and a lecture on narcissism at the Department of Psychology, University of Copenhagen. The teaching programme was funded by ERASMUS Staff mobility. Book chapter on “Online social networks in the work context” by Juliane Stopfer and Sam Gosling is now published in D. Derks & A. Bakker (Eds. ), The Psychology of Digital Media at Work (pp. 39-59). Hove: Psychology Press. Roos Hutteman has successfully passed her doctoral examination. Congratulations! 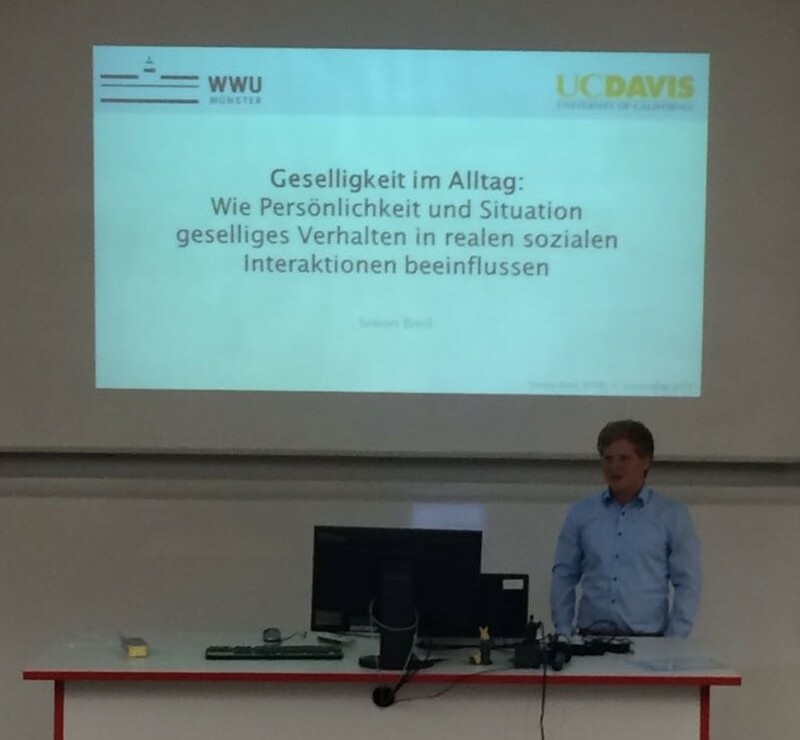 Mitja Back gave an invited talk at the Department of Psychology, Bergische Universität Wuppertal: "From partner preferences to romantic relationships: Unfolding the dating black box". On October 17th, the habilitation process was opened for Meinald Thielsch to obtain the venia legendi for the field Psychology. New paper by Uwe Kanning, Meinald Thielsch, Lisa Träumer, and Torsten Brandenburg now published in Report Psychologie: "Gaudeamus igitur? – Das Psychologiestudium aus der Sicht von Berufspraktikern." Juliane Stopfer and Roos Hutteman started as research assistants in our lab - welcome! Prof. Dr. Mitja Back is appointed Associate Editor of the European Journal of Personality (official starting period 1 January 2013). With 7 talks, 2 poster presentations and 2 chaired symposia our work group made a strong contribution to the 48th Congress of the German Psychological Society in Bielefeld. Dr. Juliane Stopfer and Dr. Albrecht Küfner have now officially received their doctoral degree and are appointed as postdoctoral researchers at our department. Congratulations! WWU press release and dpa press release features our ongoing research projects about the (un)-popularity of narcissists and the mutual development of personality and social relationships in general. 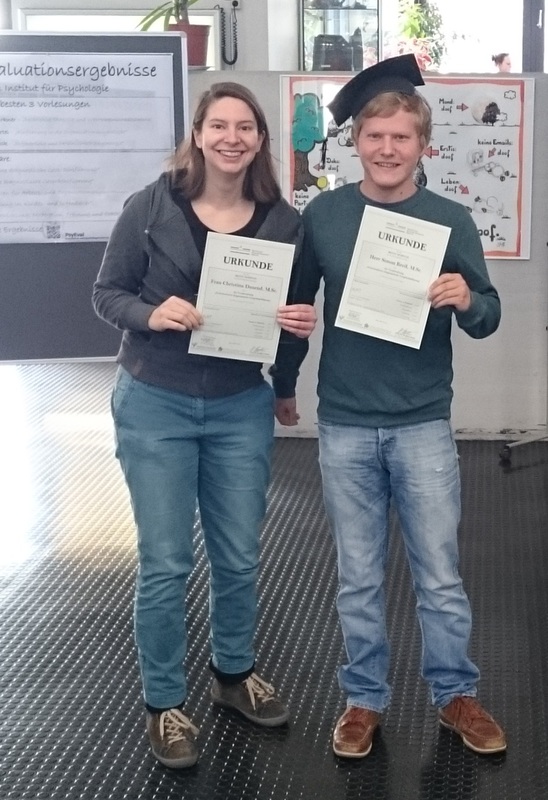 Juliane Stopfer and Albrecht Küfner have successfully passed their doctoral examination. Congratulations! With 5 talks our workgroup made a strong contribution to the 16th European Conference on Personality in Trieste. Moreover, we chaired 3 symposia: Albrecht Küfner chaired a symposium together with Michaela Schröder-Abé, titled "The Social Life of a Narcissist: Intra- and interpersonal processes", and Mitja Back chaired a symposium together with Chris Nave titled "How personality can be a truly behavioral science" as well as an invited symposium on "Self-knowledge" together with Simine Vazire. Our research on friendship is featured in the June issue of "NEON"
Best poster award for Meinald Thielsch and Rafael Jaron (Nordlight Research) at the General Online Research (GOR) 2012.